Elysium Is An Excellent casting, cinematography and story make it a Sci-fi winner. Outer space never looked so good in the exciting sci-fi adventure Elysium now in theaters. Well acted, designed and filmed, the movie gets right in the meat of the story and puts the viewers right in the action. Fast moving and exciting the film moves close to the front runners for my choice for best action films for 2013. The film takes you on a fantasy trip between Earth and Elysium a nicely devised space station 250 miles above for the rich. Earth in the 22nd century has been depleted of most of its natural resources, has been experiencing over population and cities have become ghettos for those that fight to stay alive among the robot police force. The people on Elysium enjoy a life full of wonder and excitement in their mansions and even their health and longevity has a machine to keep them alive forever. Among the men working in sweat mills making parts for the space station is Max a hard worker with a criminal record and a former member of the resistance that smuggles people into Elysium. His work can be dangerous and on this particular day he's asked to crawl into a manufacturing unit to free up a jammed door. In the process he gets covered with radiation, brought to a medical lab and told he has only 5 days to live. When he goes to the resistance and asks them to smuggle him into Elysium to get cured they agree if he'll take on a risky mission. The story follows Max as he fights for his life in an effort to travel to the space station. Writer and Director Neill Blomkamp (District 9) keeps his film moving at a fast clip showing the degradation of the Earth, the pristine Elysium, a quick introduction to his main stars then plowing into a nonstop thriller that amazes, mesmerizes and excites with fantasies about our future in despair. Handling the subject matter with special attention to wealth versus poverty, Blomkamp brings out a lot of issues that our current situation resembles. With the over population in the world, important resources getting weaker and our environment being abused the film sends a challenging message. Showing the authoritarian government in place protecting the rich and keeping the results of the erosion of the Earth from their doors, he builds a wicked tyrannical image that's inhumane and avaricious. Elysium features excellent acting with Matt Damon developing a likable character that shows compassion for his mission while keeping Max on course in the face of danger. While Max does have a selfish plan, it's the wave of helping the resistance he generates that makes him a viable character. Strong willed, empathetic to the cause and with a courageous intent he gives a hero's performance that makes the film work. Jodie Foster makes her character Secretary of Defense Delacourt a determined, power crazed director of the Elysium homeland security. She pacifies the rich by pampering them while trying an underhanded scheme to take over the leadership of the thriving island in the sky. When faced with non citizens being smuggled into Elysium she thinks of them as collateral damage in protecting the population. The cinematography, special effects, CGI and set designs are spectacular bringing the future to life in a world gone mad. Showing the contrast between the decaying Earth and the opulence of the world in space helps provides the fantasy that makes the film work. The vehicles that shuttle the 250 miles to the space station, military ships, droids, the space station, costumes and more are functional and visionary keeping the film in the year 2163. Elysium has been rated R by the MPPA for strong bloody violence and language throughout. Be cautious when deciding to allow anyone under the age of 17 see the film as it does have some scenes that may be inappropriate. 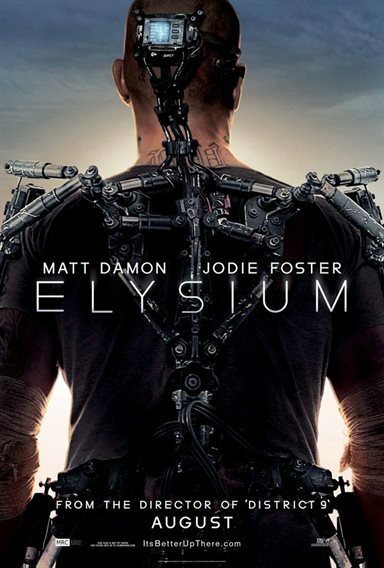 Download Elysium from the iTunes Store in Digial HD. For more information about Elysium visit the FlickDirect Movie Database.